Pretty sure I have never seen before. I think someone posted that years ago? Life magazine? Nice pic,very Nice Vespa ! Street Look like Roma? He must be pretty good if he can ride with those boots; looks like high heels and slick bottoms. Yea, no grip on those decks. Or maybe he's just standing there and not moving? The guy on the Vespa has his left foot down, so he's not moving - or at least not very fast. And notice his left hand is squeezing the control for the rear brakes. Old Vespa's have the gear change on the left side. I did start a thread on this, but there's not much there yet http://bulldogskates.websitetoolbox.com/post/celebrities-and-skateboards-7211475?pid=1285481693. In fairness, I've never even been on a Vespa, but I Googled "Vespa controls" and that's where I got the info. Probably applies to more current models as I didn't specify. But Vespa dude has his left foot down, so if he's moving, it sure isn't very fast. But it's a cool picture regardless. Anyone know where it is? wanderingRobin said "Roma" previously. I look at signs and stuff in the background as not familiar with the buildings. Harold Tribune and NY Times satellite offices and a clock that has "...NDON" at the bottom. Thoughts? London? 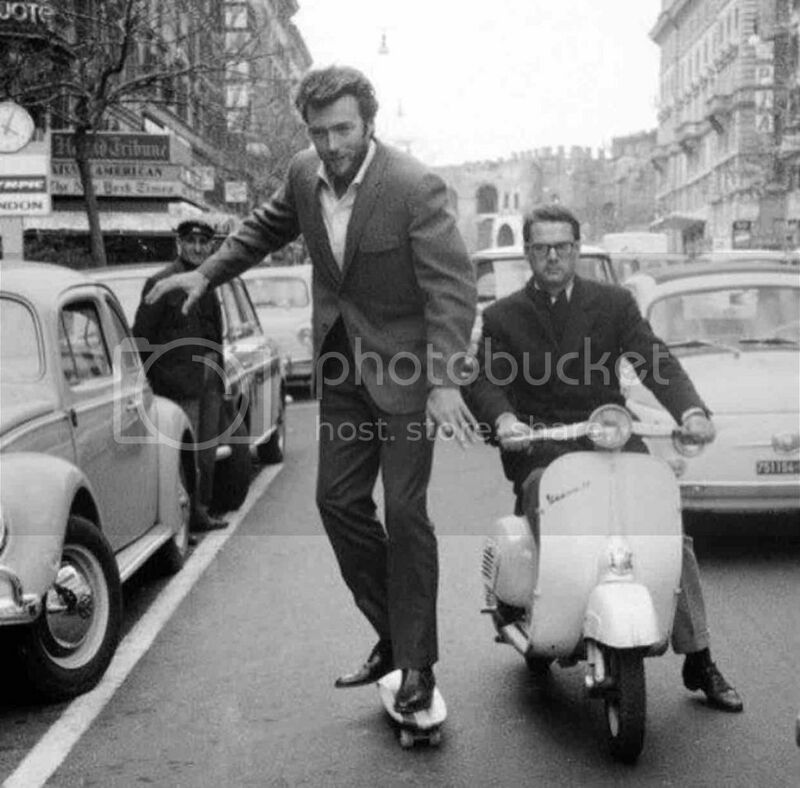 Edit: Damn, Google "Clint Eastwood Skateboarding" and it has this picture and says Rome, 1964 (and a few others say 1965). Nice call wR. That pre 57 bug looks pretty sweet. doesn't get much cooler than Clint Eastwood surfing sidewalk!